This week’s fossil is a strange one. Mr. Darrell Ellis collected the above tiny specimen from the Hungry Hollow Member (Middle Devonian) at the famous Hungry Hollow location near Arkona, Ontario. (He also took this excellent photograph.) In the classic way exploratory paleontology works, he contacted an expert, my friend Olev Vinn at the University of Tartu in Estonia. Olev was puzzled, having never seen anything like it, so he sent the image to me. I was baffled. Darrell next sent me the actual specimen, which I examined an photographed. 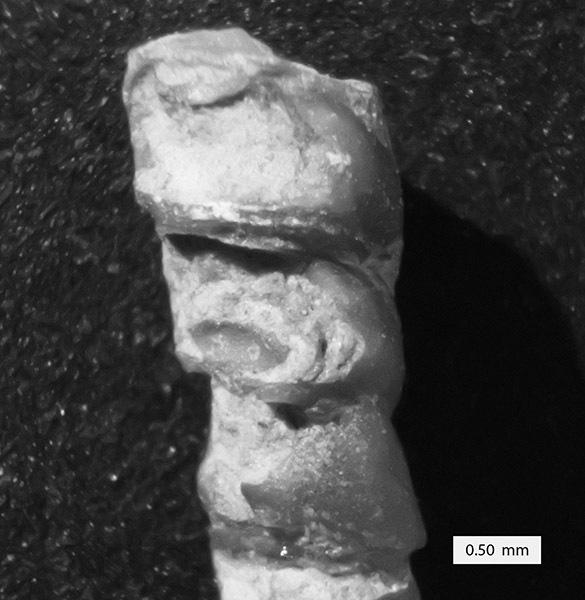 I could see that it is a calcitic spiral, flattened tube extending from a discoidal holdfast at its proximal end. I then passed images on to another buddy and expert, Paul Taylor at the Natural History Museum in London. The form is new to Paul as well, and he suggested it might be an odd microconchid, a twisty tube-dweller now extinct. That made sense, even if no microconchid like this has ever been described. 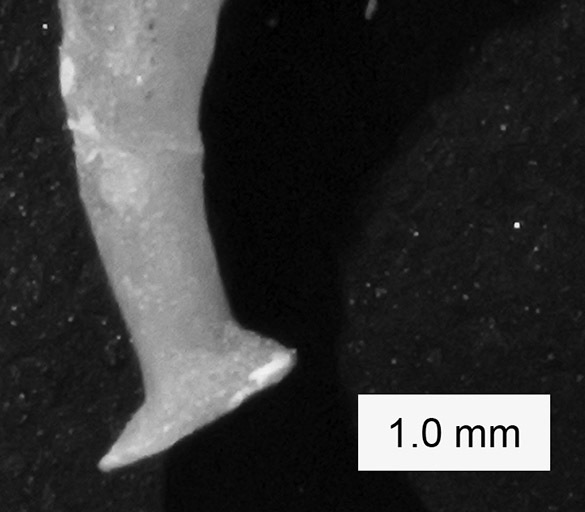 We know that some microconchids did grow tubes extended upwards (such as Helicoconchus from the Permian of Texas, described earlier in this blog). Since we need to see the microstructure of the calcitic tube to support the hypothesis that this is a microconchid, I then sent the specimen to yet another friend, Michał Zatoń at the University of Silesia in Poland. He will examine the specimen with a scanning electron microscope (SEM). This is citizen science at work. Thank you, Darrell, for donating this specimen to science. It is also a reflection of how small scientific networks exchange ideas, information and specimens — Olev, Paul and Michał have been featured in this blog many times; we are old friends and colleagues with similar interests and diverse skill sets (and equipment!). This is a closer view of the top of the spiral. We hope that Michał will be able to see the microstructure of the calcite on these broken surfaces. This is the simple holdfast of this specimen. The tube began to grow upwards very early in its ontogeny. If you have ever seen a specimen like this before, whole or partial, please let me know in the comments or by email. We have only this one specimen that is clearly “new to science”. Other collectors and paleontologists may have bits of this they did not recognize before. Again, thank you to Darrell Ellis for his sharp eyes, eagerness to contact experts, and generosity! Wilson, M.A., Vinn, O. & Yancey, T.E. 2011. 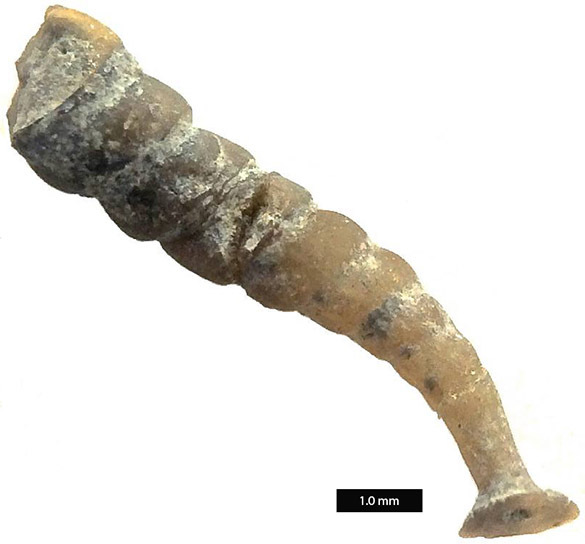 A new microconchid tubeworm from the Artinskian (Lower Permian) of central Texas, USA. Acta Palaeontologica Polonica 56: 785-791. Zatoń, M. & Vinn, O. 2011. Microconchids and the rise of modern encrusting communities. Lethaia 44:5-7. Zatoń, M., Wilson, M.A. and Vinn, O. 2012. Redescription and neotype designation of the Middle Devonian microconchid (Tentaculita) species ‘Spirorbis’ angulatus Hall, 1861. Journal of Paleontology 86:417-424.